Maingear's Steam Machine didn't make it into Valve's brochure. At 4.5 x 4.23 x 2.34 inches and weighing less than a pound, it's pretty easy to miss. While many of the official third-party Steam Machine partners have been doing their damndest to make a full-size gaming PC as small as possible, manufactures like Maingear (and, judging from the photo, Gigabyte) are taking a different path towards creating an unobtrusive living room box. The plucky little Maingear Spark isn't a gaming PC shrunk down. It's a gaming laptop without a screen, tucked inside a charming little box. Utilizing AMD's A8-5575M processor and Radeon R9 M275X mobile video card, Maingear has gotten rid of all the bits that make a gaming PC big, leaving only this delightful little box. They've packed quite a lot into such a small space. It's not the most powerful Steam Machine, of course. That's not the point. It's a PC gaming box you can toss into your backpack or tuck into your purse. All you need is your Steam controller, a TV, and an HDMI cable, and you're in business. 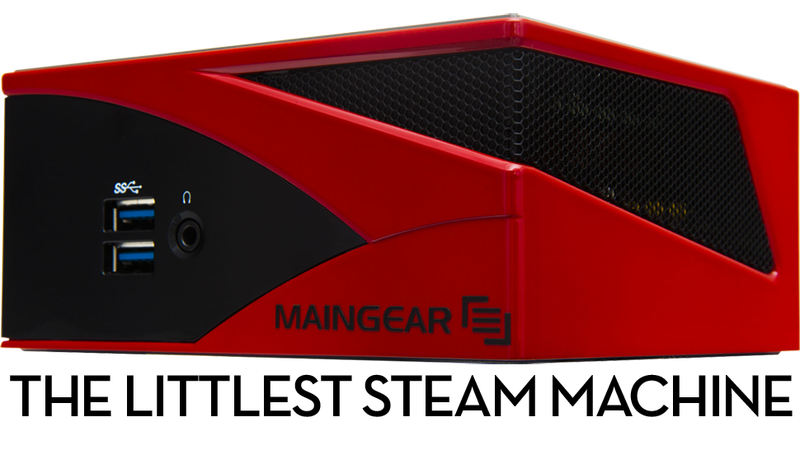 "The Spark is a first for Maingear, this extremely small and powerful gaming box will make gamers really look at what they want in a small form factor PC." said Wallace Santos, CEO and founder of Maingear "We have been working with Valve for over a year building what we think is a great performing tiny PC with tons of storage for games and entertainment, we are very excited to be releasing this soon." There's no pricing for the Spark yet, but Maingear says its meant to be an "affordable PC solution." This is what I wanted from a Steam Machine, right here. Not another gaming PC in a smaller, tighter box. I wanted something different, power and performance be damned. Maingear's Spark sounds like just the ticket.